This post really has very little to do with prepping. My wife made the best cranberry bread I have ever had. It was so delicious; I just wanted to share it with you. 2 teaspoons grated lemons or 2 teaspoons grated orange rind. Heat the oven to 350 degrees. Grease the bottoms only of 2 bread pans. Mix the cranberries, sugar, oil, milk, lemon peel, vanilla and eggs in large bowl. Stir in remaining ingredients. Pour into bread pans. Bake 50 to 60 minutes or until toothpick inserted comes out clean. Cool 10 minutes. 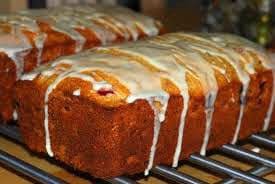 Your can ice the loaf with confectioners sugar or you can use cream cheese icing. I liked the cream cheese icing. This was great, enjoy it for the holidays. This entry was posted in cooking, recipes and tagged cranberry bread, Howard. Bookmark the permalink. Yes they are. Sorry, I try to put everything in but sometimes my husband is in a hurry and am always behind. (LOL) Am doing mini loafs of these for a meeting and then of course Christmas baking starts. I hope you love it as much as we do. Thanks for writing.